It was not easy to make a selection from inZagreb appartments, as all of them are situated in very nice places of Zagreb, nicely furnished and either in or close to the city center with easy access by public transportation. All what is needed for making a decision which one to take is available on the webside inZagreb.com. Still I preferred to have a look and Ksandro took me around, and finally I settled in the Olive appartment. The Olive appartment offered everything that is important to me: Secured parking place for my car, quiet location, in walking distance to many famous locations in Zagreb, but still on the outskirts of Zagreb with easy access to biking paths and park areas for walking and jogging. Not too big for one, but still room enough to host my wife and two kids when they joined me. Both of them are excellent examples for great hospitality and customer orientation. One can learn a lot from them! Quality: With inZagreb there is quality around you, starting with their offering on the website, then the booking, the welcome and of course the quality of the appartment itself. What I, who lived a "bachelor" life in Zagreb, enjoyed most was the included weekly cleaning service. It was always a pleasure to enter the clean and tidy appartment at the start of each week. Equipment of the appartment: Everything there, ready to settle in and enjoy. Not just the equipment you would expect, but also coffee, tea, sugar and even cooking ingredients if one wishes to cook and eat at home. If not, brochures in the appartment (regularily re-newed) give you all the information about where to go in Zagreb for entertainment or to eat. The bike: Have you every seen a rental appartment coming along with a mountain bike, ready to jump on it and explore the exiting surroundings of Zagreb, like Medvedgrad fortress, Jarun lake or Maksimir park. With inZagreb bikes those places were suddenly at reach for me. Competitive price: I travel a lot and know how much good accomodation may cost. 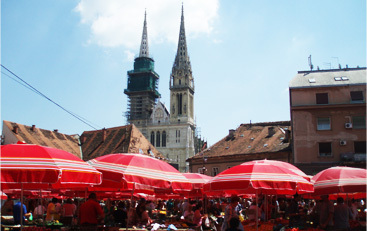 inZagreb is offering very competitive prices and excellent value for money (e.g. compared to similar quality hotel accomodation). Positive surprise: Small things that matter, like seasonal decoration of the appartment,a bottle of wine and fruit basked at arrival, or the clock that Ksandro changed at change of clocks to winter time. Or simply a handwritten, personal welcome greeting from Ksandro after being out for some days, very nice. An emergency number at hand: Being abroad in a foreign country, with no friends around and the language not understood! It was just a good feeling to know that Ivana and Ksandro were always just a phone call away, if an emergency occurs. Lucky me, I never had to call upon this service, but I always felt safe. The Piano apartment was wonderful! It was centrally located, quiet and much larger than we anticipated. Very well located and bright, large apartment. We found you in Rick Steve's guide book. Apartment Gold is a gorgeous apartment, with an ideal location. We liked the weell equipped kitchen - even though we ate out, we enjoyed it and being able to cool white wine and making tea and many times when we are travelling we shop at the market and eat in, so really nice. The washing machine and drying rack plus laundry detergent was much appreciated, after a week on travel and a week to go, nice to have all our clothes clean! We found the manual so we could figure out how to use it, but instruction would have helped. The wireless internet and the DVD player were fantastic. Thanks - we loved it! We found about you through Lonely Planet guide to Croatia. Location is absolutely perfect for tourists. We had our first toaster after renting apartments in Croatia for 3 weeks! Liked the extra touches like coffee, tea and staples. By far the most completely equipped apartment we have stayed in in Croatia. Dining room clock needs new battery (that's settled - Ivana says!). Thanks for pick-up and drop off service and sorry for the confusion upon arrival! From Larry: Zagreb is now one of our favourite cities - it was a serendipity that there was a music festival yesterday. Very enjoyable and a highlight of our vacation. The two of you are a wonderful example of the spirit we found everywhere in Zagreb. From Liz: I'm glad we stayed in apartment Orange. It gave us a very different perspective on Croatia and Zagreb, as a non-tourist as it0s possible to get. Thank you for your hospitality! Everything was wonderful. We loved the location and the restaurant downstairs. Very nicely decorated too - especially the plate! Nice touches everywhere - hvala! Excellent, friendly and informative service from Ivana and Ksandro. Great apartment and location. Very impressed! The apartment had everything we needed. Very comfortable, clean, well organised and great location. Puno Vam hvala! Bilo je odlicno! Found you through Lonely Planet. The apartment has been fantastic - really made our stay in Zagreb enjoyable. Thanks for the local tips on music etc. Had a very enjoyable stay. Piano apartment clean, comfortable and everything we need. Nice extra touches with bowl of fruit and a bottle of wine. Will definitely be coming back. location of White apartment - wonderful!! We liked the apartment and location but feel 3 people maximum can be accommodated in Gold. We wouldn't hesitate to recommend your service. (as written on our webpage - this apartment is ideal for two but can fit three. Some families, especially during summer, when they are travelling through Zagreb, ask us if the apartment can accommodate 4 and we say, yes, if there are two younger children - but it is a bit tight, I agree - Ivana explains). Excellent location and lovely apartment that contained everything we needed. It was great that a washing machine was available as well as internet access. The kettle may be reaching the end of its life (we changed it! - Ivana). Thanks for a wonderful stay! We will be back! Thank you. We had a pleasant stay. Overall I had a great stay! The location of the apartment White is perfect! Also the air-conditioning worked well to cool the apartment during the hot days. Service was great, the apartment was clean and Ivana and Ksandro were very accommodating to my requests (i.e. extra set of keys, electrical converter etc). Will use inZagreb again and will recommend to others. Great place - well appointed, lots of comfort for the family. Central to all city sites. We enjoyed our stay. Thank you so much for a wonderful stay in Zagreb! Daniel and I really enjoyed our time there. We will be sending our friends your way. Smjestaj u apartmanu Spring je pretvorio nas boravak u Zagrebu u jedno od nasih najtoplijih putnickih iskustava. S lakocom smo se uzivjeli u ulogu zitelja Mandalicine ulice. Nakon posjeta muzeja i setnji zagrebackim ulicama bilo je predivno cuti rijeci koje su djeca izgovarala pri nasem povratku: "Evo nas kod kuce". Odlazimo punog srca i sa zeljom da ponovno dodemo ovdje. Hvala na svemu! The premises were excellent, we couldn't wish for anything better. We enjoyed our stay tremendously, no complaints at all. Good location, clean, very nice layout and feel - we wish we had this as a home! Thank you for the pick up from the airport and all the explanations - it helped us undersand the city better. By the way, the Sljeme cable car is down, only way up is by car or bus - very nice ride though! Wonderful apartment, great location, very clean, we felt comfortable. Everything we needed was there: internet, balcony, coffee, microwave, bicycle. Great location, great service. We enjoyed our time here in Zagreb very much. Thank you so much for everything. Excellent service for booking and arrival. The apartment is excellent - very well furnished, all necessary equipment available, spotlessly clean. Location perfect - quiet and green, but so close to the city. A wonderful experience. Thank you so much! Suggestion - include safety box. Excellent apartment - congratulations!!! Thank you for everything. We had a wonderful stay in your apartment and in Zagreb. We appreciated very much your kind attention from the enquiry to check-out! Sorry again for our mistake regarding check-in dates and for our delay at the arrival. The apartment and services were great. We love this apartment and is really easy to get to the centre from here. It will be in our recommendations, if someone comes to Zagreb. Thanks! The Olive is perfect, extremely clean and comfortable, and well furnished. An excellent quality apartment. A short walking distance to the centre. We had a superb trip to Zagreb from the minute Ksandro picked us up at the airport. The apartment is so well equipped, even supplying an umbrella when the weather was showery. The location is fabulous, within easy walking distance of everywhere. A superb holiday. The service and staff were excellent. I liked a lot my stay in Zagreb as well as the visit to Opatija and Rijeka. Kiitos paljon - hvala lijepa! Although several weeks have already passed since my visit, I did want to convey my warmest appreciation to you and your husband for your kind and perfect attention during my stay in the apartment in late January. I recently recommended inzagreb.com to my friend who will soon make arrangements to visit your beautiful city and stay in your serviced apartment. I stayed at InZagreb apartments on two different occasions. In both cases, the apartments were pleasant, well equipped, and Ksandro and Ivana went out of their way to make me feel at home.